Welcome to our Inspire, Create, and Share May blog hop! Our theme this month is "It's A Girl Thing!" Each hop participant will have a gorgeous creation that you can CASE (copy and share everything) for the special ladies in your life! May is the last month for our Occasions catalog and our retiring 2015-2017 In Colors. I had to maximize using my adored Mint Macaron ink and papers and favorite supplies before they are gone. This card is made for a special friend going through some exciting changes. I love her dearly and hope this brightens her day! All supplies for this card are listed at the end of the post. The "Suite Sentiments" stamp set is very versatile to coordinate with other suites in the Occasions catalog. There are many fonts and sentiments for several occasions. I really love this "Everyone needs a friend like you" sentiment. What do you think of this stamp set and how I used it? Please contact your favorite demonstrator for ordering assistance. I am happy to be your demonstrator if you do not already have one selected! I have more information about ordering and perks down at the end. Please continue reading to the end and my free gift offer. 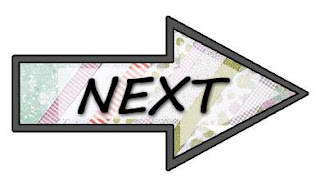 Then you can click on this arrow to visit the next blog to see what Tammy has designed! PS my card fits the SUO Challenge #173-All That's Feminine so I've entered it there too, check it CLICK HERE for lots of great girlie ideas!